But something strange happens as you read through the Bible. As verse piles on top of verse, and book links up to book, you realize that an immovable force and an unstoppable plan set into motion at the dawn of creation is gaining titanic momentum. As Malachi shuts the creaking door on the Old Testament, the world is left in utter darkness like a room after the candlewick slowly fizzles out. …and then the doors are blown from the hinges, and the Son of God bursts onto the stage of humanity with such violent love and brilliant light, and the powers of Darkness are thrust aside, and every illness is healed, and the people are blinded by the glory of Jesus Christ. But as the crowd stands rubbing their eyes, squinting into view is not a throne and a victorious king, but a whipped and beaten man hanging on a cross. That perpetual motion, that feeling of fate, that mysterious destiny proved to be none other than the Divine Hand of God determined to crush his Son. Peter tells us that Jesus Christ did not stumble out of Mary’s womb and into a manger by accident. No, he was “foreknown before the foundation of the world but was made manifest in the last times for your sake” so that he might ransom sinful men like us with “[his] precious blood…like that of a lamb without blemish or spot” (1 Peter 1:18-20). All of the sudden, those words, “In the beginning,” start to take on new meaning. Foreknown before the foundation of the world—that’s what Peter says. In other words: God knew Jesus would die for sinners even before Genesis 1:1. 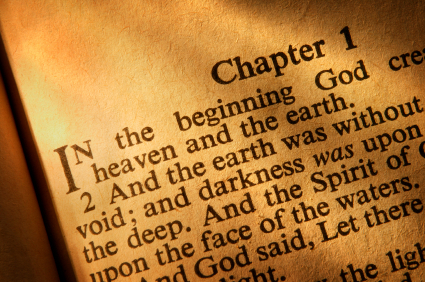 And yet…and yet, Genesis 1:1 still happened. That’s the glory of God. The glory of God is that he knew. He knew that as soon as he spoke those fateful words, “Let there be light,” he was choosing to put his Son to death for sinful people. Genesis 1:1 is a foundational belief for the new believer because it is important for him to know the Creator of the Universe. However, Genesis 1:1 gathers more beauty with age. As the believer comes to realize what it cost God to choose to create this world, he begins to relish his mercy and compassion anew. God knew, and yet he still created. That is the full glory of God—not just a God of knowledge, wisdom, power, might, and holiness, but a God of self-sacrificial love for his creatures, of mercy on sinful men, and of forgiveness. My little 2 year-old son just memorized Genesis 1:1, and for most of us children’s Sunday school is the last time we pondered this verse. What depth of mercy and grace still remains there at the Bible’s starting place for us to mine from its simple words! May we never again read over God’s self-introduction without stopping to thank him—because he knew, and yet he still created.